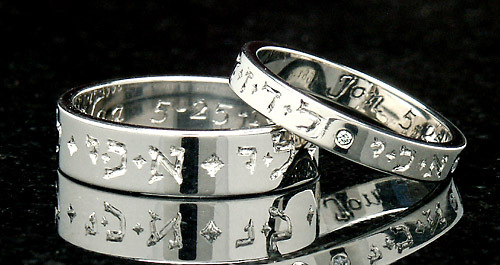 “I am my Beloved’s and my Beloved is mine” poesy rings in Hebrew, Scottish Gaelic, and Irish Gaelic. An alternative is our own Hebrew font, as shown below on these flat, 14K white gold, custom poesy rings shown in 3mm and 5mm widths. The 3mm is accented with four tiny diamonds. Note these rings are also shown without antiquing; they are not available antiqued. Just like flat rings, we can use any of several widths for domed rings. The rings immediately below, inscribed with “I am my Beloved’s and my Beloved is mine” in Scottish Gaelic are domed with widths of 3.5mm and 6mm. These are very heavy rings – about 2mm thick. 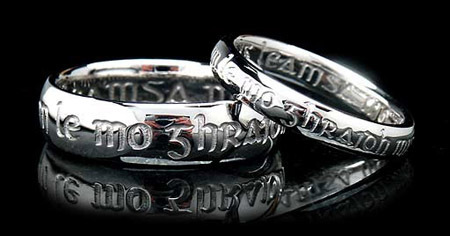 Please note the saying on these rings is so long, part of it is on the outside and part on the inside. 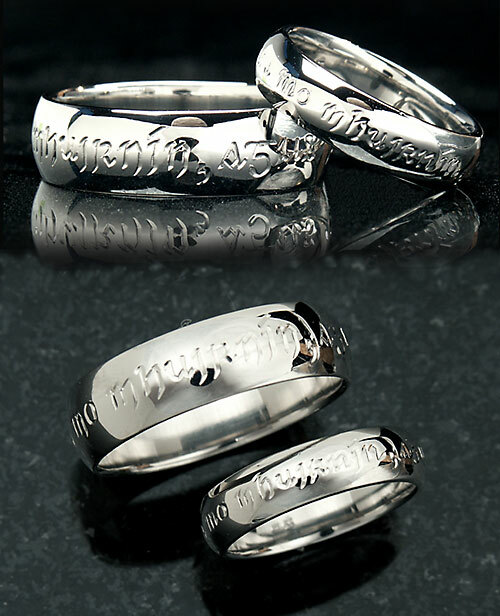 Another image shows domed rings with the same scripture in Irish Gaelic, and these rings are 5mm and 7mm wide. These are also very heavy rings, at least 2mm thick. Shown is platinum, but we can make them in 14K white, yellow, or rose gold, or palladium. The same is true for almost all of our Beloved’s rings.